Barack Obama is no longer the president. Since he’s been relieved of his duties, number 44 has been chilling -- wearing a backwards hat and yucking it up with Virgin Airlines CEO Richard Branson. Obama’s reintroduction to civilian life has involved its fair share of water sports, as he squared off against Branson in a “kitesurf vs foilboard learning contest,” as the British tycoon put it on Twitter. Cue the Sheryl Crow, everybody, because Barack is really soaking up the sun. He is eating, praying, and loving. Branson wrote about his budding bromance with ex-commander-in-chief, expressing all sorts of remorse for Obama’s inability to frolic on beaches while leading the country. “One of the first stories Barack told me when he and Michelle arrived on Moskito Island was how, just before he became President, he had been surfing on a dangerous break in Hawaii. When he came in from an exhilarating session, the new head of his security team turned to him and said: ‘This will be the last time you surf for eight years.’ For the next eight years he didn’t have the chance to surf, enjoy watersports or do many of the things he loved,” Branson wrote on the Virgin website. Obama was accompanied by former first lady Michelle to Branson’s privately owned Moskito Island, part of the magnate’s opulent compound of smiling British people in the Virgin Islands. It looks like he enjoyed himself. 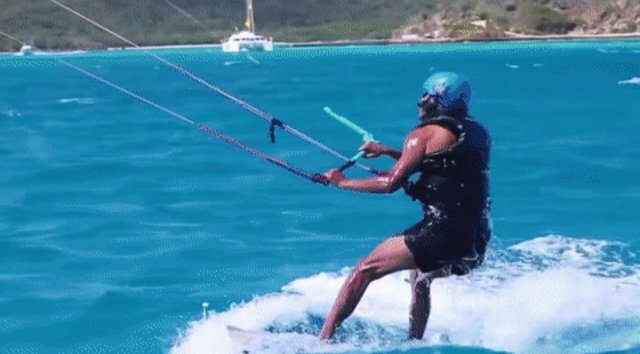 And if there’s one way the former president will slowly sink into the annals of history, it might be riding a wakeboard, majestically, into the tropical distance.